CITE AS: Flo Laino, "18 Timbers," in 100 Minories, October 11, 2017, https://100minories.lparchaeology.com/18-timbers/ [Date Accessed: April 23, 2019]. 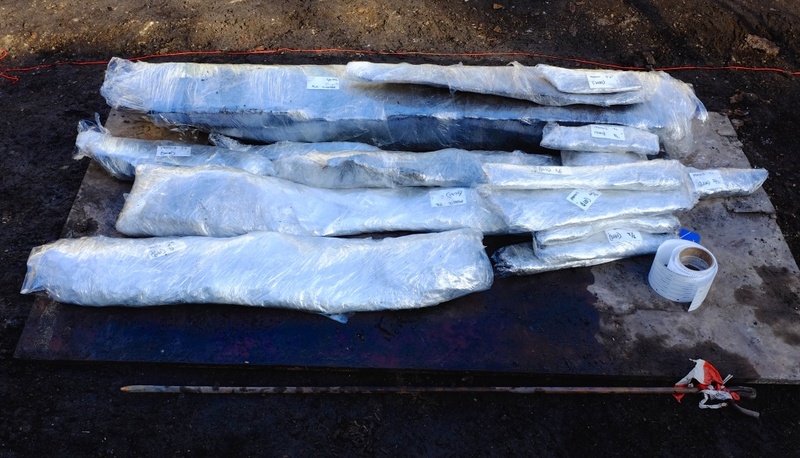 You may recall back in 2015 from our photo diaries here, here and this article here, the large quantity of timber found in Area C (both singular artefacts and structures) during the dig, all carefully excavated, prepared and wrapped in clingfilm to be transported off site. 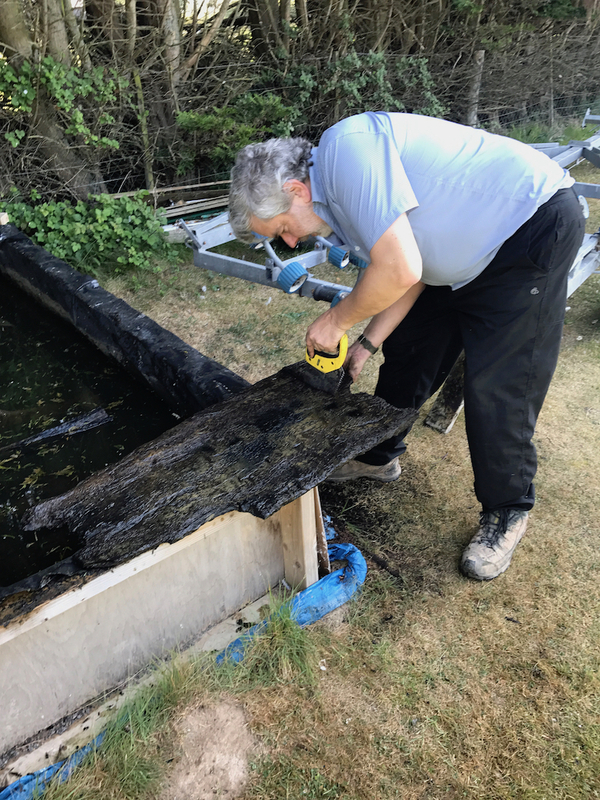 Of the 174 timbers that were recovered across the site, 41 were selected for dendrochronological analysis – to provide us with those handy spot dates to cross-reference with dating evidence from our other classes of evidence. Two years down the line, the results are in, with great thanks to Ian Tyers at Dendrochronological Consultancy Limited for his services. Samples taken by Ian Tyers for dendrochronological analysis. The timbers selected consisted of 40 oaks, and 1 elm – a mixture of short and long lived, fast and slow grown timbers. 12 were identified as grown in London and the South East, 4 were from France, and 1 from Germany (Tyers 2017, 5). The majority of the material was a mix of staves from barrels, tubs and buckets, likely from wine barrels, or those used for salted fish. Of this assemblage only 18 of the timbers were successfully dated, with the earliest material giving a felling date of 1493AD /1494-1525AD, and the latest, a barrel stave, the timber felled in 1592-1628AD (Tyers 2017, 9). The majority of the material dates to the 16th century, and may add to the evidence that the infilling and reclamation of the ditch occurred within a relatively short timeframe (though not discounting the fact that these artefacts may have had a significant lifespan and may have been re-used over time). Preparing the timbers on site for transportation. 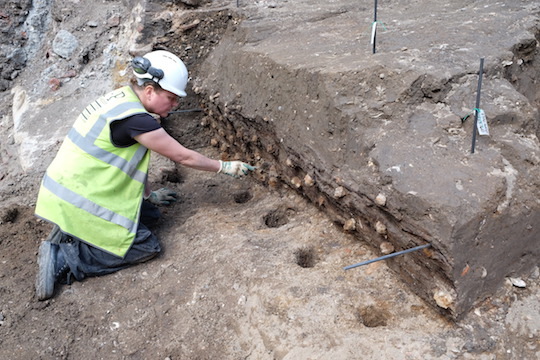 Perhaps the stand out result relates to the large timber revetment we found in the later phases of the City Ditch somewhat summoned forth from the ground(!) by our Project Officer Chiz Harward, writing in this article back in November 2014, just as we started the 100 Minories excavation. In his article Chiz explored Stow’s 16th century work, the ‘Survey of London’ for clues as to what may have lain beneath the surface at Minories. Of the ditch Stow gives us a history; a 200 feet (60 metres) wide earthwork built between 1211 ad 1213 around the City Wall, and a series of dates when the ditch was ‘cleansed’, starting with Edward III’s orders for the ditch to be cleared out due to its overflow into the Tower Moat. According to Stow, the ditch in this area (roughly from Aldgate to the Tower) was cleansed in 1519, 1540, and again in 1569 when a new ‘sewer’ and ‘wharf of timber from the head of the Postern [Gate] into the town ditch’ was installed. With the aid of our Dendro results, we can now say with some confidence that the revetment found at Minories is that of Stow’s writings. 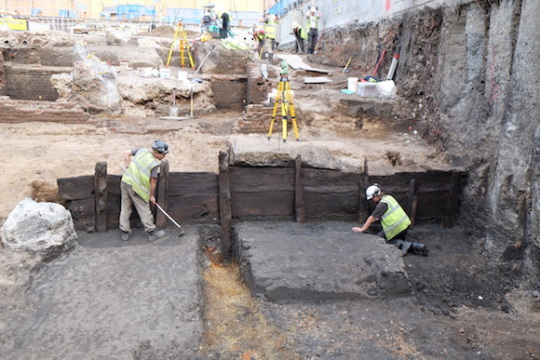 4 piles and 4 planks from revetment 3097 were successfully dated, of which 3 of the piles were shown to be from the same tree, and 2 of the planks from the same tree – giving an interpreted construction date for the revetment to be 1567 – 1575. At our Pop Up Museum in June 2015, our early interpretation of the revetment told a story about land management and power over the ditch. Documentary sources tell us that different sections of the ditch were the responsibility of differing authorities, with some areas maintained by the City and Guilds of London, perhaps organised on a ward by ward basis, and others such as the area around the Tower of London, the responsibility of the Crown. As such different sections of the ditch would have looked different to one another, a prime example of this being another revetment (3211) discovered on site, later in the ditch sequence, made from some form of reused structure, possibly a door (pictured below). Could the large timber revetment (3097) with its fine, likely expensive, strong-standing timbers be representative of the Tower Authority’s jurisdiction and investment? Revetment (3211) – the timber had rotted away leaving postholes and rivets in situ. We know from Stow that within living memory the ditch had previously been ‘open, without wall or pale, having therein a great store of very good fish’ had been closed off, its banks let out to those who had the ‘spoil[s]’ to themselves, and furthermore that in 1569 the ditch was more of a ‘sewer’, perhaps a reflection of its changing use by those who controlled its access. Perhaps the revetting of the ditch by the Tower in this area was a last attempt to shore up the area around the Postern Gate of the City Wall, the south gate of which is known to have suffered from substantial subsidence, and disappears from cartographic record by the 17th century, presumably demolished. Whilst we were not able to retrieve datable samples from all the timbers (particularly those from this later 17th century timber-lined structure, found on site), the spot dates have shone a light into this class of findings and the life of the ditch – and we will continue to update here with new analysis and interpretation, as our Post Excavation work forges on. Tyers, I. (2017). ‘Tree-ring spot-dates of archaeological samples: 100 Minories, City of London (sitecode MNO12)’. Report 961. Dendrochronological Consultancy Limited.